This has to be one of the quickest recipes to date, but it’s nourishing and comforting without being too heavy, and it takes as long as a scallop to cook, which really is quick. 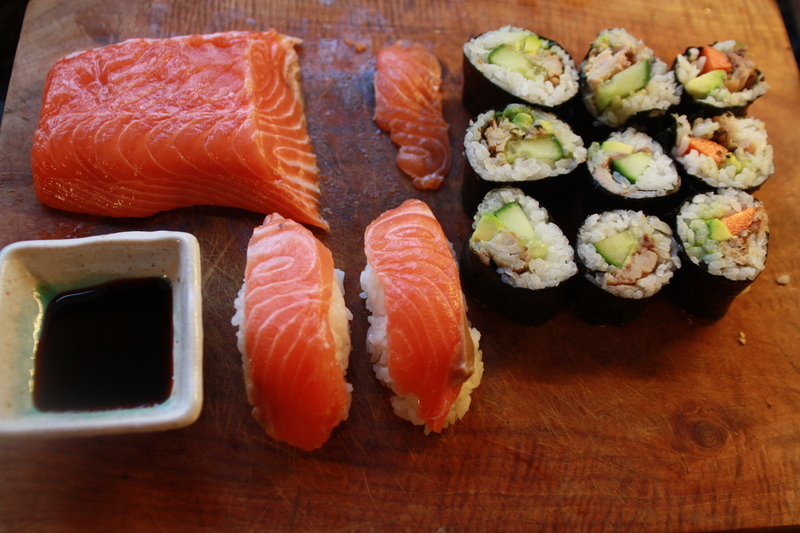 I served it as a starter before a main course of my Easy Homemade Sushi, and it went down a treat. The scallops are sweet and juicy at this time of year and have tender bright orange roes, some people remove these but for me they are they best bit, try to get diver caught scallops from a good fishmonger. Heat a small frying pan with a little sunflower oil until smoking, pop in your scallops and chopped garlic and a good squeeze of lime. 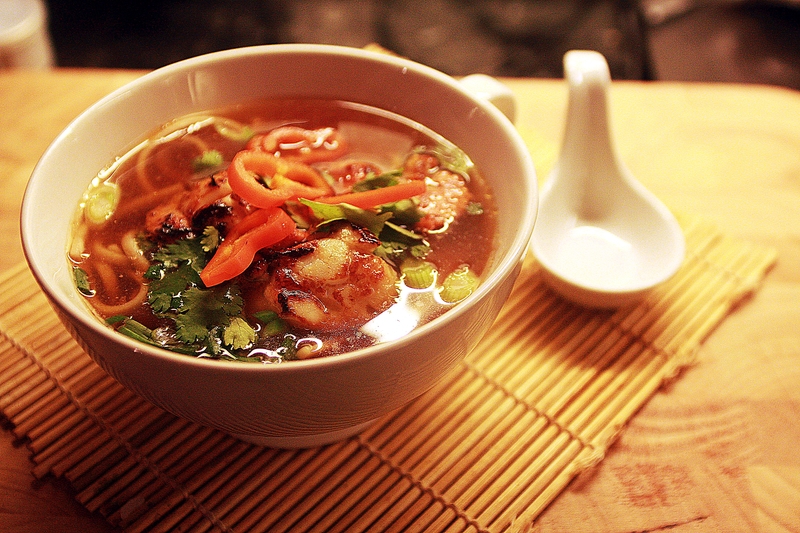 Make up your Miso soup with a cup of boiling water in your soup bowl and add the cooked noodles. Turn your scallops, they should be a lovely brown colour and will only take a couple of minutes to cook, it’s so easy to overcook scallops, so less is definately more. Once cooked pop the scallops on top of the noodles, and garnish with any or all of the garnishes and the soy and sesame oil. This is a bit cheaty and easy compared to my usual recipes, but got a really good review from my tasters (wife and friend). Eating sushi out is often a highly disappointing experience either very poor quality or very expensive, but it really is incredibly easy to make at home. Using sushi rice (I like Clearspring) wash the rice until the water runs clear, and then heat in a rice cooker or lidded pan to the ratio of 100g rice to 125g water per person. Bring to the boil and then simmer until the water is absorbed by the rice, take off the heat and allow to sit without removing the lid for 10 minutes. 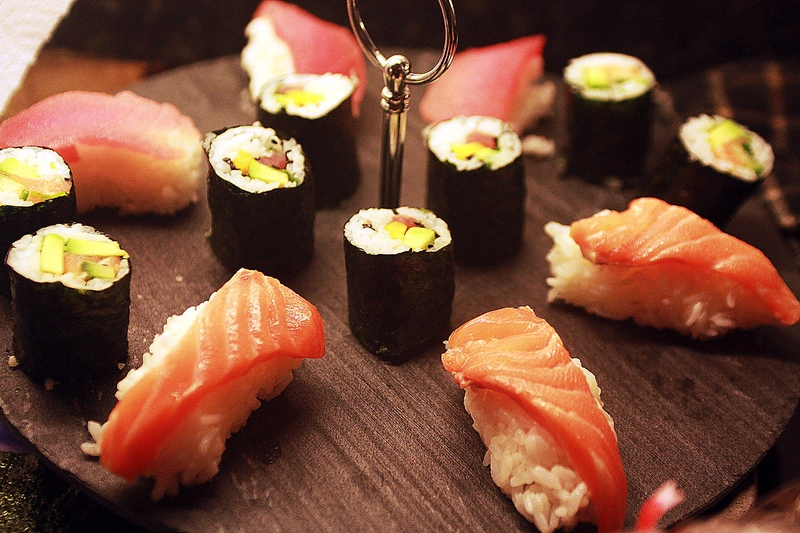 Make up a seasoning with 90ml sushi rice viegar, 2 tbsp sugar and 1 tsp salt stirring until these dissolve. Spread the rice out onto a large tray and sprinkle with the seasoning using a wooden spoon to mix gently and allow to cool, using a fan is traditional here. 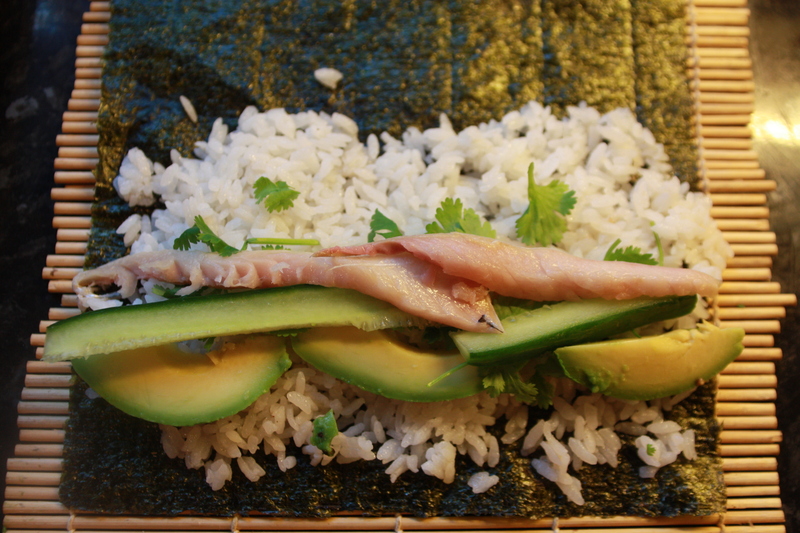 To make a simple Norimaki roll, lay down a sushi rolling mat with a sheet of nori seaweed. Dip your fingers into a bowl of cold water (this stops the rice sticking) and spread out some rice over two thirds of the nori, not too thickly. You can then lay thin strips of whatever takes your fancy on the middle of this, favourites are cucumber, carrot, avaocado, pepper, and then some fish if you fancy, salmon, or my favourite raw mackerel (you can use raw or smoked fish if you wish), and then a sprinkle of coriander, or a smear of wasabi, it really is up to you. Once you have the sushi laid out it’s time to get rolling. Keeping an even firm pressure roll the end nearest you over and over again, releasing the front edge of the rolling mat as it goes over. The first one you do will probably be a bit loose, but you’ll soon get the knack of it. Nigiri is made by shaping a small ball of rice in your hand, and simply laying a slither of fish on top, in my case I went for raw salmon, but you could use whatever takes your fancy. Serve up with some soy sauce, pickled ginger and wasabi.